Hello again friends! This week the Scrapalicious Design team has issued the challenge to create something that uses a Border Punch and the color turquoise. That opens the field up pretty well! I used an EK Success Border Punch called Double Crochet. You really should check out the prices on the punches at Scrapalicious because this punch was ONLY $7.00. I know! I can't believe how great the prices are! 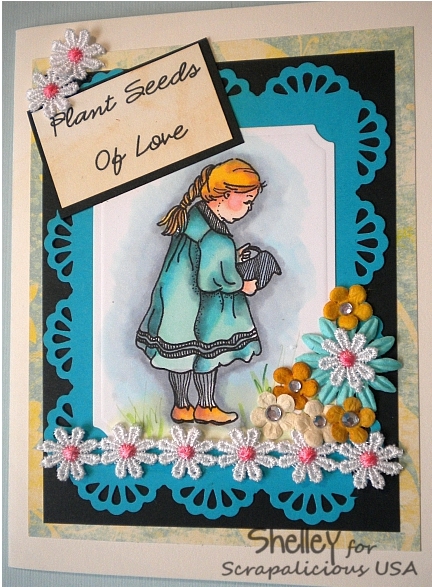 I was going to make a tutorial on how to create the frame I made for this card, but due to time restrictions I wasn't able to accomplish that. There is a very good description at the video here though in case you were scratching your head how to make the corners work out with a corner punch. Please come join us on our challenge this week. We look forward to seeing what you come up with! Your card is beautiful! I love all the flowers and the coloring is amazing! lots of lovely flowers on this...thank you for joining us over at Creative Craft Challenges..
What a very sweet and pretty card...that frame is perfect for the image! Thanks for joining us at Sentimental Sundays.